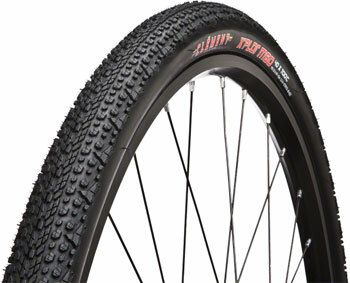 The XPlor MSO is an adventure tire designed for mixed conditions. The combination of smooth-rolling center knobs and aggressive shoulder lugs provide great traction and durability for gravel roads, trails, cyclocross, urban assault and even pavement. The MSO will fit on your cyclocross or gravel bike, commuter, and touring rig and comes in two sizes: 700 x 40mm and 700 x 32mm.The MSO tire is named for the airport code of Missoula, Montana, home of the Adventure Cycling Association and the inspiration for countless cycling journeys.Clements XPlor adventure tire series is designed to bridge the gap between pavement and blazing your own trail. Each tire within this series is designed for multiple conditions from off-road touring to gravel racing to just getting outta Dodge.Available in either 60 or 120 TPI models.